90 lenses per box @ $55.11 per box. Minimum order 2 boxes (three months' supply). 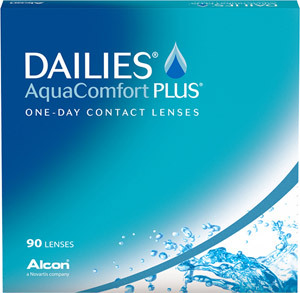 Cibavision's new premium daily disposable, Dailies AquaComfort Plus is the first ever contact lens to feature Ciba's Triple Action Moisture system - three moisturising agents working together to provide comfort throughout the day: a lubricating agent provides instant comfort when the lens is inserted, a wetting agent provides moisture during the course of the day, and finally a moisturising agent refreshes the eye each time the wearer blinks.